Tomorrow Molly and I are heading north to Scotland for a Highland fling on the shores of Lochs Linnhe and Leven. Philip & Derek (my friends in Barbados) are currently at their home at Onich for a month, and are welcoming 22 friends for a houseparty this weekend (Friday to Monday), a highlight of which will be dinner, in kilt and dicky bow, at Port Appin’s well-known Pierhouse Restaurant on Sunday evening. 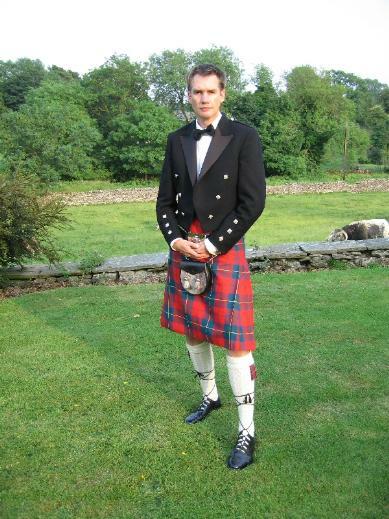 As you can see, my kilt rather stands out from the crowd. The tartan is ‘Ruthven’. I’m very (very) remotely descended from the infamous Lord Ruthven who, in 1566, murdered secretary David Rizzio in front of Mary, Queen of Scots. The weather looks mixed wet and dry, which means having to pack for all eventualities. Thank goodness I’m driving and therefore have unlimited space for our clobber! Taking advantage of free wireless connection at hotel to update my blog tonight. Saturday (my birthday): departed the New Forest and headed steadily north for the border with deviations to Kendal and Carlisle en route. Overnighted at Annandale Water as per usual, but with an added excursion to Dumfries for a KFC supper, a first for Marion. My back held up remarkably well. Weather: gloriously sunny. Sunday: Johnstonebridge to Ardrhu by Ballachulish via Glasgow and Oban. Took breakfast at the Dumbarton Little Chef (unremarkable), then halfway up Loch Lomond skewed west for Inveraray (with a flying visit to Loch Fyne Oysters at Cairndow). Marion loved the historic town of Inveraray, particularly the architectural uniformity. A sharp shower of rain as we left the town, headed west for Connel (sunny again) and a loop down to Oban for a visit to McCaig’s Tower (a first visit for me as well as Marion). Heading north to Ardrhu we diverted to Port Appin bathed in sunshine and mirror still sea. And finally we arrived at Ardrhu to stay with P&D at their 1890s hunting lodge on Loch Linnhe. I drove all the way from Johnstonebridge and felt remarkably well for it. The wonder of medication and a positive mind. Monday: an early departure (well, 9.00am) with an ominous forecast of rain ahead. North through Fort William to Invergarry and then west to Cluanie and Dornie, north/northeast to Stromeferry (no ferry) and Lochcarron, and finally to Applecross for a lunch date with J&C at Tigh Ruaraidh which was bathed in sunshine as had been the entire drive thus far. Two hours later we set off on our next leg of the day, destination Stoer by Lochinver. I already knew this would be a marathon drive in four hours available (we had a 7.00pm deadline for dinner), and we used the ‘fast’ inland route via Achnasheen and Garve (sunshine gave way to dark forbidding cloud) to Ullapool (sunny again), and then north of Ullapool turned left to Achiltibuie driving underneath Stac Pollaidh, and then turned sharp right onto the much-heralded (and greatly favoured by Wainwright) ‘Little Mad Road of Sutherland’ to Inverkirkaig and Lochinver, continuing on to Stoer and our overnight stop at Cruachan House (highly recommended). We arrived with fifteen minutes to spare before dinner! Later we took a drive out to Stoer Lighthouse and I gazed wistfully over to Lewis and Harris in the sparkling west. Back still holding up remarkably well, but was not inclined to walk. Couldn’t have achieved so much without considerable dosages of painkillers. Tuesday: scudding clouds with blue patches, weather forecast for heavy rain late afternoon and overnight. Headed for Clashnessie and Drumbeg, and thence to Kylesku and my all-time favourite bridge. We drove over it, and then back again, and down to the village and ferry slipway. Then back across the bridge, parked, and walked back over the bridge. Saw a seal swimming underneath the bridge. Patchy cloud with sunny spells set off the landscape beautifully, then north through Scourie to the Kyles of Durness. Lunch at Balnakeil Bay (very short, sharp shower of rain), then to Tongue. Instead of crossing the causeway we (as recommended by Wainwright) we diverted along the original road to Kinloch for a spectacular view of Ben Loyal bathed in sunshine. Bettyhill next, I wish that we had had time to take the Strathnaver Trail, somewhere I’ve wanted to visit for a long time but I’m afraid it will have to wait another visit to the north. And then we arrived in Thurso, found our super B&B for the night (Pentland Lodge House – again, highly recommended). Fish and chips for supper and a flying visit to John o’Groats for Marion’s benefit. We’ve to be up early in the morning (7.00am breakfast) and a two mile drive to Scrabster Harbour for early Stromness ferry to …. ORKNEY! Pills popped regularly during the day but I do feel a lot better nonetheless. Really looking forward to meeting Stromness Dragon on Thursday. I’m twittering our movements (as O2 signal permits) so you can check out our current whereabouts at www.twitter.com/x333xxx if you wish!